KOLKATA: A section of postpaid users and corporate customers are getting their monthly mobile bills late as big phone companies are struggling to capture the impact of the goods and services tax (GST) on invoices issued post-July 1. Bharti AirtelBSE -0.55 %, India’s No 1 phone company, has sent out text messages to some of its postpaid customers saying their bills would be delayed by at least a week this month owing to technical issues. ET has seen these text messages. AirtelBSE -0.55 % postpaid customers in Delhi and Kolkata told ET that they had been informed by the company’s customer care wing that the reason behind the delayed billing was GST-related. The country’s second-largest mobile carrier, Vodafone India, in turn, is learnt to be facing a tough time billing corporate or ‘enterprise customers’ on schedule as many clients have not shared their GST registration numbers. Under GST rules, telcos are required to the mention a corporate customer’s GST registration number in their monthly mobile bill. “There could be some delays in billing Vodafone’s enterprise customers as many have not furnished their GST numbers yet,” said a person aware of the matter. At press time, Bharti Airtel did not reply to ET’s queries. But a top company executive attributed the delayed billing to postpaid customers to Airtel’s “systems transitioning to GST and software upgrades being tested”. “Everything is working smoothly but all systems are being double checked, which is why the buffer of one week has been kept for this billing cycle,” the Airtel executive told ET. 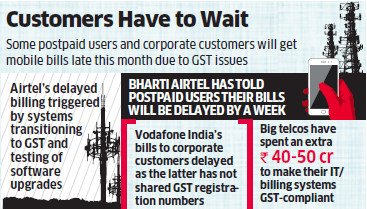 Vodafone India did not reply to ET’s queries on GST-related billing challenges faced by the telco. Third-largest carrier Idea CellularBSE 3.40 %, however, said it had not faced any technical challenges in billing postpaid or corporate customers, post-July 1. “No bills have been delayed on account of GST,” said an Idea spokesperson in a written response to ET’s queries. But another industry executive aware of the problem in some companies said postpaid billing could typically get delayed if there are operational hiccups in rejigging a telco’s back-office IT & billing systems to make them GST-compliant from July 1 as mandated by the government. “A telco will be compelled to push back its billing cycle if there are technical challenges in deploying software patches in its IT/billing systems to reflect the applicable GST rate in all invoices issued from July 1,” said the executive, who did not wish to be named.